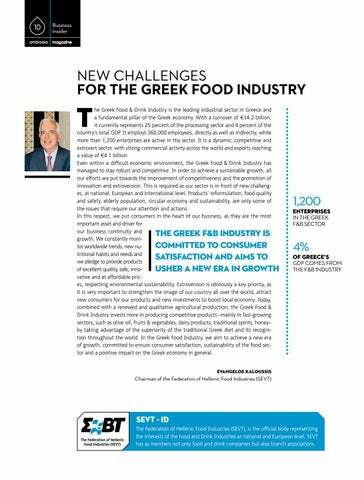 he Greek Food & Drink Industry is the leading industrial sector in Greece and a fundamental pillar of the Greek economy. With a turnover of €14.2 billion, it currently represents 25 percent of the processing sector and 4 percent of the country’s total GDP. It employs 360,000 employees, directly as well as indirectly, while more than 1,200 enterprises are active in the sector. It is a dynamic, competitive and extrovert sector, with strong commercial activity across the world and exports reaching a value of €4.1 billion. Even within a difficult economic environment, the Greek Food & Drink Industry has managed to stay robust and competitive. In order to achieve a sustainable growth, all our efforts are put towards the improvement of competitiveness and the promotion of innovation and extroversion. This is required as our sector is in front of new challenges, at national, European and international level. Products’ reformulation, food quality and safety, elderly population, circular economy and sustainability, are only some of the issues that require our attention and actions. In this respect, we put consumers in the heart of our business, as they are the most important asset and driver for our business continuity and the greek F&B industry is growth. We constantly monicommitTed to consumer tor worldwide trends, new nutritional habits and needs and satisfaction and aims to we pledge to provide products of excellent quality, safe, innousher a new era in growth vative and at affordable prices, respecting environmental sustainability. Extroversion is obviously a key priority, as it is very important to strengthen the image of our country all over the world, attract new consumers for our products and new investments to boost local economy. Today, combined with a renewed and qualitative agricultural production, the Greek Food & Drink Industry invests more in producing competitive products –mainly in fast-growing sectors, such as olive oil, fruits & vegetables, dairy products, traditional spirits, honey– by taking advantage of the superiority of the traditional Greek diet and its recognition throughout the world. In the Greek Food Industry, we aim to achieve a new era of growth, committed to ensure consumer satisfaction, sustainability of the food sector and a positive impact on the Greek economy in general. The Federation of Hellenic Food Industries (SEVT), is the official body representing the interests of the Food and Drink Industries at national and European level. SEVT has as members not only food and drink companies but also branch associations.